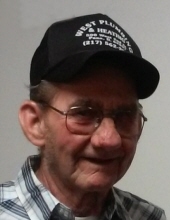 Jerry Durbin, 80, of Pana passed away Tuesday, January 29, 2019 at Heritage Health - Pana. He was born January 12, 1939 in Vandalia, IL to the late Lloyd Samuel & Maggie Irma (Sarver) Durbin. Jerry was raised in Beecher City and went on from there to proudly serve his country in the U.S. Army. He had lived most of his adult life in the Pana area. Jerry worked for Prairie Farms and later bought and operated West Plumbing & Heating until his retirement. He enjoyed tinkering around his garage and was quite the handy man, always finding odd jobs to keep him busy. He also enjoyed his time working at the Senior Center and sitting outside, visiting with his neighbors. He loved his dogs and especially his many grandchildren. Jerry married Janet Miller on December 31, 1958 and the later divorced. He then married Mary Lourash Hammond on December 17, 1993 in Taylorville and she preceded him in death on May 4, 2018. Jerry is survived by his children: Luke Durbin of Shelbyville, Sherri (Gary) Hunter of Tower Hill, Floyd (Jeanne) Hammond of Effingham, Bill (Donna) Hammond of Wynnewood, OK, Tom (LaDonna) Hammond of Odin, & Susan (Larry) Rose of Bethany; 26 grandchildren; 61 great grandchildren; 5 great-great grandchildren and nieces & nephews. He was also preceded in death by sons: Rick Hammond & Mike Hammond; brothers: Junior Durbin, Russell Durbin & Stanley Durbin. Memorial services will be Friday, February 8, 2019 in McCracken-Dean Funeral Home at 7:00 p.m. with Jack Moss officiating. Visitation will be Friday, February 8, 2019 from 5:00 p.m. until service time in the funeral home. A committal service will be held on Saturday, February 9, 2019 at 11:00 a.m. in Buchanan Cemetery, rural Herrick with military rites by Pana Veterans Honor Guard. Memorials in Jerry’s honor may be made to the Dementia Society of America or the Christian County Animal Shelter. "Email Address" would like to share the life celebration of Jerry Durbin. Click on the "link" to go to share a favorite memory or leave a condolence message for the family.